"UTC" redirects here. For other uses, see UTC (disambiguation). Coordinated Universal Time (abbreviated to UTC) is the primary time standard by which the world regulates clocks and time. It is within about 1 second of mean solar time at 0° longitude, and is not adjusted for daylight saving time. In some countries where English is spoken, the term Greenwich Mean Time (GMT) is often used as a synonym for UTC and predates UTC by nearly 300 years. The system has been adjusted several times, including a brief period where time coordination radio signals broadcast both UTC and "Stepped Atomic Time (SAT)" before a new UTC was adopted in 1970 and implemented in 1972. This change also adopted leap seconds to simplify future adjustments. This CCIR Recommendation 460 "stated that (a) carrier frequencies and time intervals should be maintained constant and should correspond to the definition of the SI second; (b) step adjustments, when necessary, should be exactly 1 s to maintain approximate agreement with Universal Time (UT); and (c) standard signals should contain information on the difference between UTC and UT." The current version of UTC is defined by International Telecommunications Union Recommendation (ITU-R TF.460-6), Standard-frequency and time-signal emissions, and is based on International Atomic Time (TAI) with leap seconds added at irregular intervals to compensate for the slowing of the Earth's rotation. Leap seconds are inserted as necessary to keep UTC within 0.9 seconds of the UT1 variant of universal time. See the "Current number of leap seconds" section for the number of leap seconds inserted to date. Time zones around the world are expressed using positive or negative offsets from UTC, as in the list of time zones by UTC offset. The westernmost time zone uses UTC−12, being twelve hours behind UTC; the easternmost time zone, uses UTC+14, being fourteen hours ahead of UTC. In 1995, the island nation of Kiribati moved those of its atolls in the Line Islands from UTC−10 to UTC+14 so that Kiribati would all be on the same day. UTC is used in many Internet and World Wide Web standards. The Network Time Protocol (NTP), designed to synchronise the clocks of computers over the Internet, transmits time information from the UTC system. If only milliseconds precision is needed, clients can obtain the current UTC from a number of official internet UTC servers. For sub-microsecond precision, clients can obtain the time from satellite signals. UTC is also the time standard used in aviation, e.g. for flight plans and air traffic control clearances. 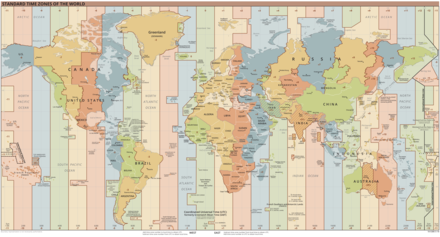 Weather forecasts and maps all use UTC to avoid confusion about time zones and daylight saving time. The International Space Station also uses UTC as a time standard. Amateur radio operators often schedule their radio contacts in UTC, because transmissions on some frequencies can be picked up in many time zones. UTC divides time into days, hours, minutes and seconds. Days are conventionally identified using the Gregorian calendar, but Julian day numbers can also be used. Each day contains 24 hours and each hour contains 60 minutes. The number of seconds in a minute is usually 60, but with an occasional leap second, it may be 61 or 59 instead. Thus, in the UTC time scale, the second and all smaller time units (millisecond, microsecond, etc.) are of constant duration, but the minute and all larger time units (hour, day, week, etc.) are of variable duration. Decisions to introduce a leap second are announced at least six months in advance in "Bulletin C" produced by the International Earth Rotation and Reference Systems Service. The leap seconds cannot be predicted far in advance due to the unpredictable rate of rotation of the Earth. Nearly all UTC days contain exactly 86,400 SI seconds with exactly 60 seconds in each minute. However, because the mean solar day is slightly longer than 86,400 SI seconds, occasionally the last minute of a UTC day is adjusted to have 61 seconds. The extra second is called a leap second. It accounts for the grand total of the extra length (about 2 milliseconds each) of all the mean solar days since the previous leap second. The last minute of a UTC day is permitted to contain 59 seconds to cover the remote possibility of the Earth rotating faster, but that has not yet been necessary. The irregular day lengths mean that fractional Julian days do not work properly with UTC. Since 1972, UTC is calculated by subtracting the accumulated leap seconds from International Atomic Time (TAI), which is a coordinate time scale tracking notional proper time on the rotating surface of the Earth (the geoid). In order to maintain a close approximation to UT1, UTC occasionally has discontinuities where it changes from one linear function of TAI to another. These discontinuities take the form of leap seconds implemented by a UTC day of irregular length. Discontinuities in UTC have occurred only at the end of June or December, although there is provision for them to happen at the end of March and September as well as a second preference. The International Earth Rotation and Reference Systems Service (IERS) tracks and publishes the difference between UTC and Universal Time, DUT1 = UT1 − UTC, and introduces discontinuities into UTC to keep DUT1 in the interval (−0.9 s, +0.9 s). It is not possible to compute the exact time interval elapsed between two UTC timestamps without consulting a table that shows how many leap seconds occurred during that interval. By extension, it is not possible to compute the precise duration of a time interval that ends in the future and may encompass an unknown number of leap seconds (for example, the number of TAI seconds between "now" and 2099-12-31 23:59:59). Therefore, many scientific applications that require precise measurement of long (multi-year) intervals use TAI instead. TAI is also commonly used by systems that cannot handle leap seconds. GPS time always remains exactly 19 seconds behind TAI (neither system is affected by the leap seconds introduced in UTC). Current civil time in a particular time zone can be determined by adding or subtracting the number of hours and minutes specified by the UTC offset, which ranges from UTC−12:00 in the west to UTC+14:00 in the east (see List of UTC time offsets). The time zone using UTC is sometimes denoted UTC±00:00 or by the letter Z—a reference to the equivalent nautical time zone (GMT), which has been denoted by a Z since about 1950. Time zones were identified by successive letters of the alphabet and the Greenwich time zone was marked by a Z as it was the point of origin. The letter also refers to the "zone description" of zero hours, which has been used since 1920 (see time zone history). Since the NATO phonetic alphabet word for Z is "Zulu", UTC is sometimes known as "Zulu time". This is especially true in aviation, where "Zulu" is the universal standard. This ensures that all pilots, regardless of location, are using the same 24-hour clock, thus avoiding confusion when flying between time zones. See the list of military time zones for letters used in addition to Z in qualifying time zones other than Greenwich. Sandford Fleming promoted worldwide standard time zones, a prime meridian, and the use of the 24-hour clock as key elements in communicating the accurate time. He referred to the resulting system as Cosmic Time. At the 1884 International Meridian Conference held in Washington, D.C., the local mean solar time at the Royal Observatory, Greenwich in England was chosen to define the Universal day, counted from 0 hours at mean midnight. This agreed with civil Greenwich Mean Time (GMT), used on the island of Great Britain since 1847. In contrast, astronomical GMT began at mean noon, 12 hours after mean midnight of the same date until 1 January 1925, whereas nautical GMT began at mean noon, 12 hours before mean midnight of the same date, at least until 1805 in the Royal Navy, but persisted much later elsewhere because it was mentioned at the 1884 conference. In 1884, the Greenwich Meridian was used for two-thirds of all charts and maps as their Prime Meridian. In 1928, the term Universal Time (UT) was introduced by the International Astronomical Union to refer to GMT, with the day starting at midnight. Until the 1950s, broadcast time signals were based on UT, and hence on the rotation of the Earth. In 1955, the caesium atomic clock was invented. This provided a form of timekeeping that was both more stable and more convenient than astronomical observations. In 1956, the U.S. National Bureau of Standards and U.S. Naval Observatory started to develop atomic frequency time scales; by 1959, these time scales were used in generating the WWV time signals, named for the shortwave radio station that broadcasts them. In 1960, the U.S. Naval Observatory, the Royal Greenwich Observatory, and the UK National Physical Laboratory coordinated their radio broadcasts so that time steps and frequency changes were coordinated, and the resulting time scale was informally referred to as "Coordinated Universal Time". In 1958, data was published linking the frequency for the caesium transition, newly established, with the ephemeris second. The ephemeris second is a unit in the system of time that, when used as the independent variable in the laws of motion that govern the movement of the planets and moons in the solar system, enables the laws of motion to accurately predict the observed positions of solar system bodies. Within the limits of observable accuracy, ephemeris seconds are of constant length, as are atomic seconds. This publication allowed a value to be chosen for the length of the atomic second that would accord with the celestial laws of motion. In 1961, the Bureau International de l'Heure began coordinating the UTC process internationally (but the name Coordinated Universal Time was not formally adopted by the International Astronomical Union until 1967). From then on, there were time steps every few months, and frequency changes at the end of each year. The jumps increased in size to 0.1 second. This UTC was intended to permit a very close approximation to UT2. There was also dissatisfaction with the frequent jumps in UTC (and SAT). In 1968, Louis Essen, the inventor of the caesium atomic clock, and G. M. R. Winkler both independently proposed that steps should be of 1 second only. This system was eventually approved, along with the idea of maintaining the UTC second equal to the TAI second. At the end of 1971, there was a final irregular jump of exactly 0.107758 TAI seconds, so that 1 January 1972 00:00:00 UTC was 1 January 1972 00:00:10 TAI exactly, making the difference between UTC and TAI a whole number of seconds. At the same time, the tick rate of UTC was changed to exactly match TAI. UTC also started to track UT1 rather than UT2. Some time signals started to broadcast the DUT1 correction (UT1 − UTC) for applications requiring a closer approximation of UT1 than UTC now provided. The excess of the LOD over the nominal 86,400 s accumulates over time, causing the UTC day, initially synchronised with the mean sun, to become desynchronised and run ahead of it. Near the end of the 20th century, with the LOD at 1.3 ms above the nominal value, UTC ran faster than UT by 1.3 ms per day, getting a second ahead roughly every 800 days. Thus, leap seconds were inserted at approximately this interval, retarding UTC to keep it synchronised in the long term. The actual rotational period varies on unpredictable factors such as tectonic motion and has to be observed, rather than computed. Just as adding a leap day every four years does not mean the year is getting longer by one day every four years, the insertion of a leap second every 800 days does not indicate that the mean solar day is getting longer by a second every 800 days. It will take about 50,000 years for a mean solar day to lengthen by one second (at a rate of 2 ms/cy, where cy means century). This rate fluctuates within the range of 1.7–2.3 ms/cy. While the rate due to tidal friction alone is about 2.3 ms/cy, the uplift of Canada and Scandinavia by several metres since the last Ice Age has temporarily reduced this to 1.7 ms/cy over the last 2,700 years. The correct reason for leap seconds, then, is not the current difference between actual and nominal LOD, but rather the accumulation of this difference over a period of time: Near the end of the 20th century, this difference was about 1/800 of a second per day; therefore, after about 800 days, it accumulated to 1 second (and a leap second was then added). In April 2001, Rob Seaman of the National Optical Astronomy Observatory proposed that leap seconds be allowed to be added monthly rather than twice yearly. There is a proposal to redefine UTC and abolish leap seconds, so that sundials would very slowly get further out of sync with civil time. The resulting gradual shift of the sun's movements relative to civil time is analogous to the shift of seasons relative to the yearly calendar that results from the calendar year not precisely matching the tropical year length. This would be a practical change in civil timekeeping, but would take effect slowly over several centuries. UTC (and TAI) would be more and more ahead of UT; it would coincide with local mean time along a meridian drifting slowly eastward (reaching Paris and beyond). Thus, the time system would lose its fixed connection to the geographic coordinates based on the IERS meridian. Assuming that there are no major events affecting civilisation over the coming centuries, the difference between UTC and UT could reach 0.5 hour after the year 2600 and 6.5 hours around 4600. ^ "Coordinated Universal Time". Oxford Dictionaries. Oxford University Press. ^ a b "COORDINATED UNIVERSAL TIME (UTC) (CCTF/09-32)" (PDF). Bureau International des Poids et Mesures. p. 3. Retrieved 30 October 2016. ^ "Coordinated Universal Time (UTC) to retain "leap second"". www.itu.int. Retrieved 12 July 2017. ^ Time Service Dept. 2016. ^ Military & Civilian Time Designations n.d.
^ Fleming, Sandford (1886). "Time-reckoning for the twentieth century". Annual report of the Board of Regents of the Smithsonian Institution (1): 345–366. Reprinted in 1889: Time-reckoning for the twentieth century at the Internet Archive. ^ a b McCarthy & Seidelmann 2009, pp. 226–227. ^ Nelson et al. 2001, p. 515. ^ McCarthy & Seidelmann 2009, p. 227. ^ Seaman, Rob (9 April 2001). "Upgrade, don't degrade". Archived from the original on 2 June 2013. Retrieved 10 September 2015. ^ "ITU World Radiocommunication Conference set for Geneva, 2–27 November 2015". International Telecommunications Union. 2015. Retrieved 3 November 2015. ^ "Coordinated Universal Time (UTC) to retain 'leap second'". International Telecommunications Union. 19 November 2015. Retrieved 19 November 2015. This page is based on the Wikipedia article Coordinated Universal Time; it is used under the Creative Commons Attribution-ShareAlike 3.0 Unported License (CC-BY-SA). You may redistribute it, verbatim or modified, providing that you comply with the terms of the CC-BY-SA.